Mina el Beida is a custom-built base used exclusively for naval purposes. Marine and frogman corps command posts are based here. There are also training centers for naval officers and specialist personnel.Some coastal patrol craft are based at Banias. 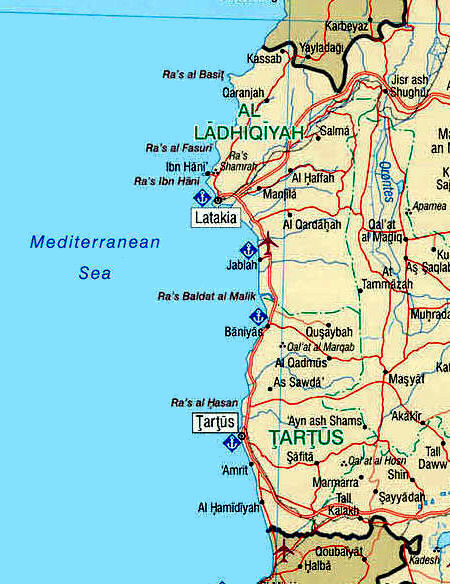 Lattakia is Syria's largest port and naval facilities there include a naval repair dockyard. Some of the fast attack craft (missile) are based at Lattakia. Tartus was not only an important base for the Syrian Navy, it also became the primary base for maintaining and replenishing Soviet/Russian submarines in the Mediterranean. Facilities include an 80,000-ton floating dock. Syria's submarine and two frigates are based there, as are the country's amphibious and mine warfare forces. Also based at Tartus are fast attack craft (missile) and coastal patrol craft. 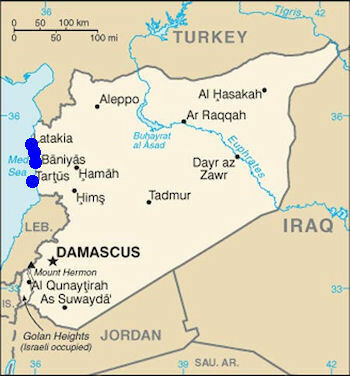 Russian warships were sent to the military base in Syria in December 2011. The fleet was led by the aircraft carrier Admiral Kuznetsov. Included also are a patrol vessel and other vessels.